Bruce Ware, a professor at The Southern Baptist Theological Seminary in Louisville, Kentucky, authored a book titled God’s Lesser Glory: The Diminished God of Open Theism. 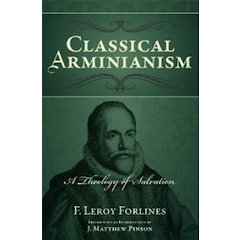 In this book, Ware first tackles the Open Theist objections to Classical Arminianism. One of the objections Open Theists have to Classic Arminians is an objection regarding divine foreknowledge. Most Classic Arminians (Open Theists believe) hold to a “simple foreknowledge” view, which states that God knows what choices a person will make. God knows if a person will choose a BMW over a Lexus; which of the five jobs a person will choose; God knows that a person will choose to eat a BLT or a Buffalo Wrap for lunch, etc. In short, every choice a person makes, God foreknew that the individual in question would make the decisions he or she does. For many Classic Arminians (Open Theists say), this suffices as the extent of divine foreknowledge. However, Open Theists respond with a blatant attack: If this is all God foreknows, then did He not “determine” it? Are not all those choices “forecaused” by God? In the examples above, God only foreknew that the individual would choose Job #3 (one out of the five jobs); but did God also foreknow that the individual “could have chosen” the other four jobs? If God’s foreknowledge is restrained to only actualized choices (to the abandonment of potential choices that never become reality), then God foreknew the choices because he foreordained them. It was under the reading of Dr. Ware that I became convinced there was a gaping hole in my system. While I still strongly believed that Classical (Reformed) Arminianism was correct, I didn’t quite know what to do with his potent critique of my system. For those who do not know, Dr. Ware is a “middle-knowledge Calvinist.” Yes, I don’t say it much, but a Calvinist helped me rethink some of my theological and philosophical views! If God only foreknows actualized choices, then God really is the Calvinist God; however, if God foreknows actualized and potential choices, then God’s exhaustive foreknowledge is maintained...while He is still preserved as a good God who is not the author of sin and evil. “That reasoning, however, does not exhaust all the difficulties which may arise in the consideration of these matters. For God knows, also, those things which may happen, but never do happen, and consequently do not co-exist with God in the Now of eternity, which would be events unless they should be hindered, as is evident from 1 Sam. xxiii, 12, in reference to the citizens of Keilah, who would have delivered David into the hands of Saul, which event, nevertheless, did not happen” (James Arminius, quoted by Dr. F. Leroy Forlines, Classical Arminianism: A Theology of Salvation. Nashville: Randall House, 2011, page 70). For Arminius, the eternal Now view of God and time does not work because, if God has “direct perception” of events, He can only have direct perception of events that do come to pass. God foreknows all events (including potential ones), but can only foresee events that will actualize in reality. That being said, the eternal Now view works for the events that take place; however, similar to the simple foreknowledge view, it fails in regard to events that never actualize (potential). The Lord told David that he Saul would come to Keilah and the citizens would hand David over...with certainty. However, as Dr. Ken Keathley, author of “Salvation and Sovereignty: A Molinist Approach,” as well as Dean of the Faculty and Vice President of Southeastern Baptist Theological Seminary in Wake Forest, NC writes in his book (mentioned above), there is a necessary distinction to be made between “certainty” and “necessity.” The fact that the Lord could affirm with certainty that Saul and the citizens would do what they did does not necessarily mean it had to happen. Rather, it means that, conditions being what they were at the time, Saul’s arrival in Keilah and David’s capture were rather probable. What made the difference in David’s case was that David fled from Keilah with his men (1 Sam. 23:13). The capture did not have to necessarily happen; this explains why David was able to escape and avoid capture. Events can be certain without being necessary, and libertarian freedom still allows for the possibility that humans themselves play a role in changing outcomes and events. In David’s case, he changed what could have easily been a very bad outcome for him and his men. All this goes to show how significant a libertarian freedom humans have been given (humans, made in God’s image after His likeness). “You have done foolishly. You have not kept the commandment of the Lord your God, which He commanded you. For now the Lord would have established your kingdom over Israel forever. But now your kingdom shall not continue” (1 Samuel 13:13-14a, NKJV). The phrase “would have established” is a counterfactual, an event that did not actualize: Saul “could have” ruled Israel, he and his descendants, forever. Unfortunately, due to Saul’s obedience, that “possible outcome” (or possible world, as Molinists would say) did not actualize. And why? Because Saul himself forfeited his right to rule. God did not select the situation where Saul would sin and forfeit the good consequence...Saul did it of his own accord. Once again, we find that affirming middle knowledge shows how significant the libertarian freedom we humans have been given. Contrary to some Arminian impressions of middle knowledge, I agree with Arminius: middle knowledge does more to boost the notion of libertarian freedom than it does to undermine it. I’m not approving of what Molinists have done with it; nevertheless, I am saying that middle knowledge (counterfactuals) is biblical...and if it’s biblical, then it’s good enough for me to affirm in my theology. These two examples from 1 Samuel will suffice as potent example of counterfactuals. For more examples of biblical counterfactuals, I’ll refer you to Dr. Ken Keathley’s work, “Salvation and Sovereignty: A Molinist Approach,” as well as Dr. William Lane Craig’s “The Only Wise God.” While philosophers will always agree on whether or not counterfactuals are true, I think there is good evidence that they do. For Arminians at least, we need to go beyond simple foreknowledge in our understanding of divine foreknowledge. If we don’t, I’m afraid that Open Theists might be right...and we Arminians could find ourselves wearing the Calvinist label.